Wait, I’m new here, what’s 31 Days? 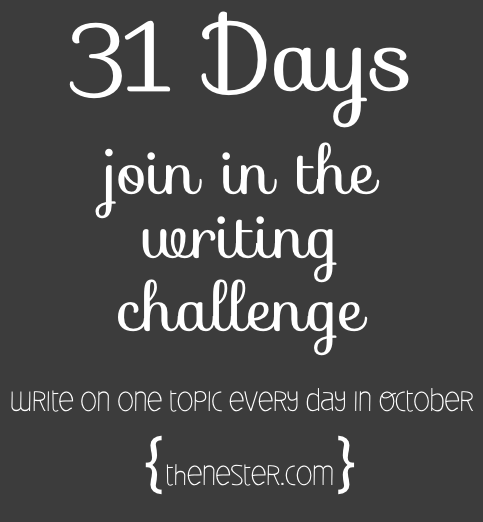 31 Days is an online writing challenge where we all link up on day one and then write about a topic of our choice every day in October. But we actually start on September 30th because it’s easier on time zones. The linkies will go live tonight sometime between 8 and 10 pm EST. I’ll have a post go live here that will link to each category. (I”ll also have my own first 31 Day post that will go up first don’t be confused). 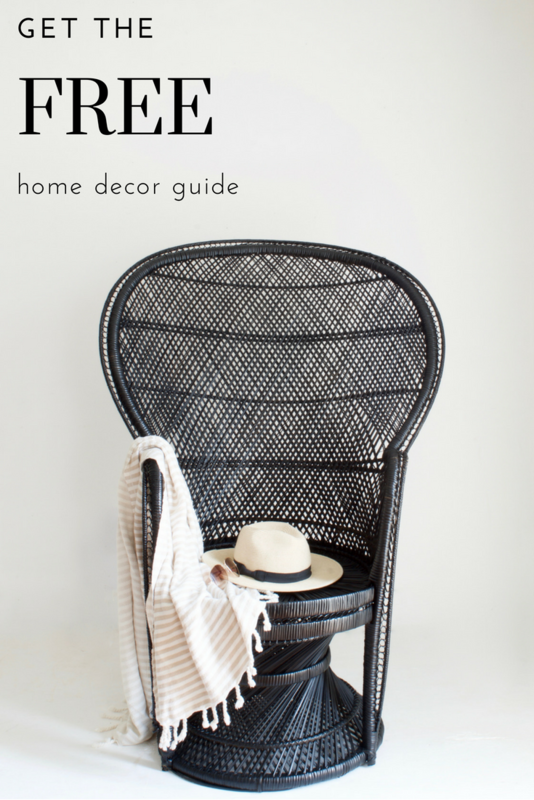 Each category will have it’s own page and own linky to help organize things. I’m shooting for having the linky posts up earlier like closer to 8, but giving myself time in case there’s a glitch somewhere, 9 linkies at once scares me, but the linky people have assured me it should work beautifully! Pick the ONE category that BEST fits you. The categories are BROAD, like a huge funnel. So if you are talking about grocery shopping then you are in the Food category. Homeschool topic=Family category. I will not be judging anyone or deleting anything because it’s in the ‘wrong’ category. So no worries there. Pick what seems like the best fit. Only link up with ONE category. Multiples will be deleted, I look at the back end to delete–so I’ll be looking at the landing pages, don’t worry if someone has your same title that isn’t cause for being deleted. You will only need to link up ONE time throughout the entire 31 Day Challenge, not every day. ONCE, so be thoughtful of what type of post you want people to land on. It could be a Welcome to Such and Such 31 Days Post, it doesn’t have to be your first day’s post, but it can be. Again, if you are confused, click on 10 or so topics from last year to see different ways people did it and what would work for you. 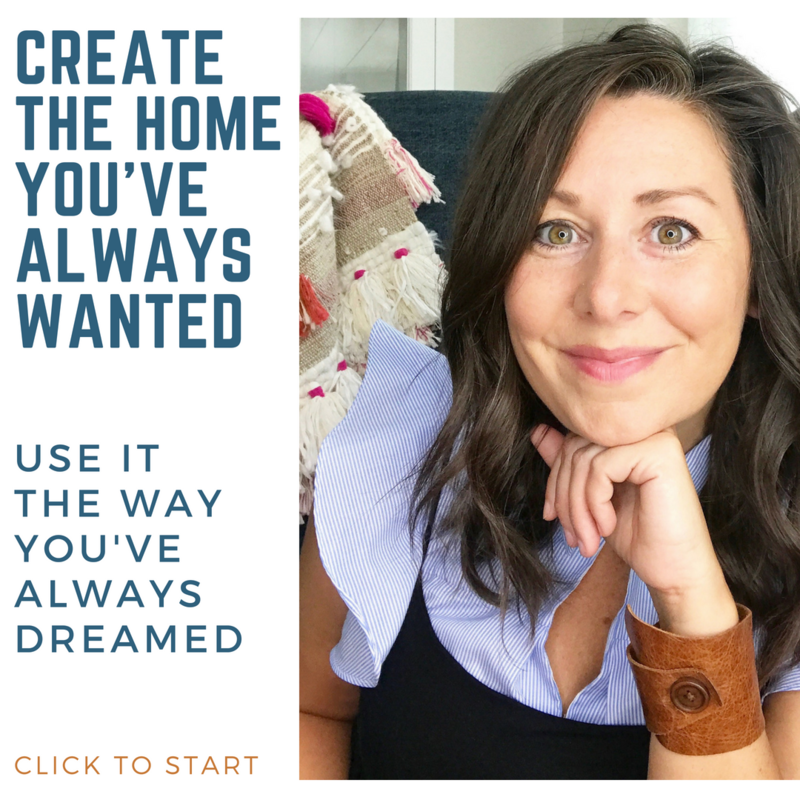 Do not link up with your home page–use a permalink, remember, link to the place you want newcomers looking for your 31 Days posts to land forevermore–even next July. Home page links will be deleted. Practice linking up here, find out what a permalink is here. I will not be able to edit your button, topic or wording for you, so sorry! Still don’t understand? Use last year’s link up as your education and see how people did it, what it is and how it works–this is the best way to learn. There were over 1200 people who each linked up one time each with their own unique topic. I will allow the link ups to stay open for 5 days, they’ll close on Friday evening. 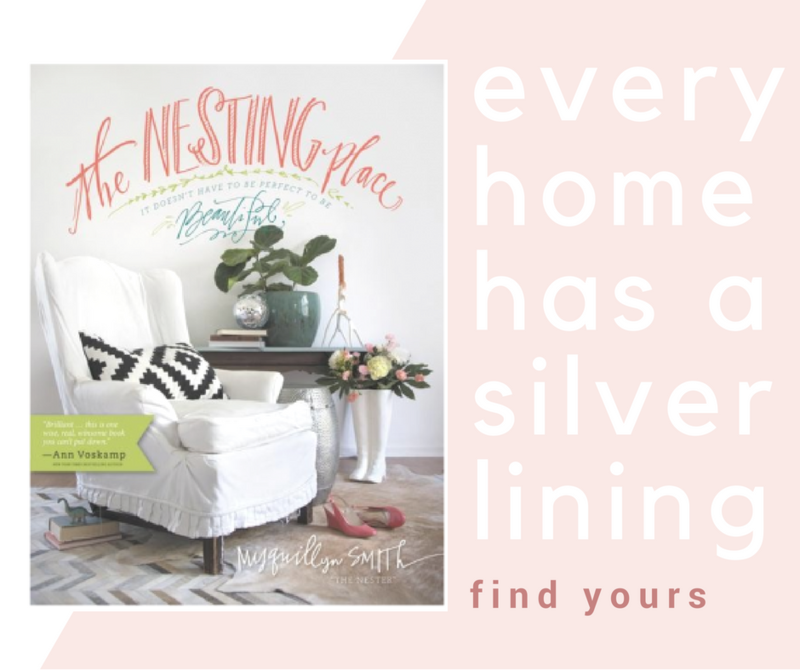 Nesting Place reserves the right to remove any link that is considered spammy or questionable in any way. Hope to see you tonight! Follow the #31Days hashtag for up to the minute announcements. PS, please do not worry about whether or not someone has written on your topic before. Because, yes, they have. And they will in the future. This is not about coming up with a perfect topic that no one has ever heard of before. This is about accepting a challenge. This is about falling back in love with writing. This is about being afraid and saying yes anyway. This is about encouraging others with something you’ve been through or taking that first step into learning something new. There are a million little topics you could write about. Or, even if we all chose the exact same topic we would all say so many different things about it because there are a million little ways to say the same thing. I hope you don’t back out because of fear. On that note, my baby sister, Emily‘s new book is out now, it’s called A Million Little Ways: Uncover the Art You Were Made to Live. It’s my favorite thing she has ever written and she wrote it for all of us…click over and watch this one minute long trailer? I’m not seeing the options or the linky? Just wanted to say from now a huge thank you for doing this again this year. Looking forward to seeing all the different topics. shhhh, don’t tell anyone but I secretly LOVE it!!! YES! A huge THANK YOU to the Nester! Without you, this amazing 1200+ community (I’m trying to imagine what the numbers will be like this year!) would not happen! Blessings! I just found your post about the 31 days. Is it too late to join? I just decided this morning to join in, and all day I’ve been letting little snips of doubt into my head. This post was just what I needed to decide to dive right in. You are so dang incouraging. Jess, I totally understand where you’re coming from. I’ve prewritten a few posts, and I started to wonder if they were good enough, and I decided YES because it doesn’t have to be perfect to be beautiful! I say go for it – everyone will be cheering you on! Thank you for doing this! Not only do I need to do this because I do, in fact, love to write, despite not being able to do it as often as I’d like, but my 31 Days Challenge is to laugh every day or make someone else laugh and I can’t wait! 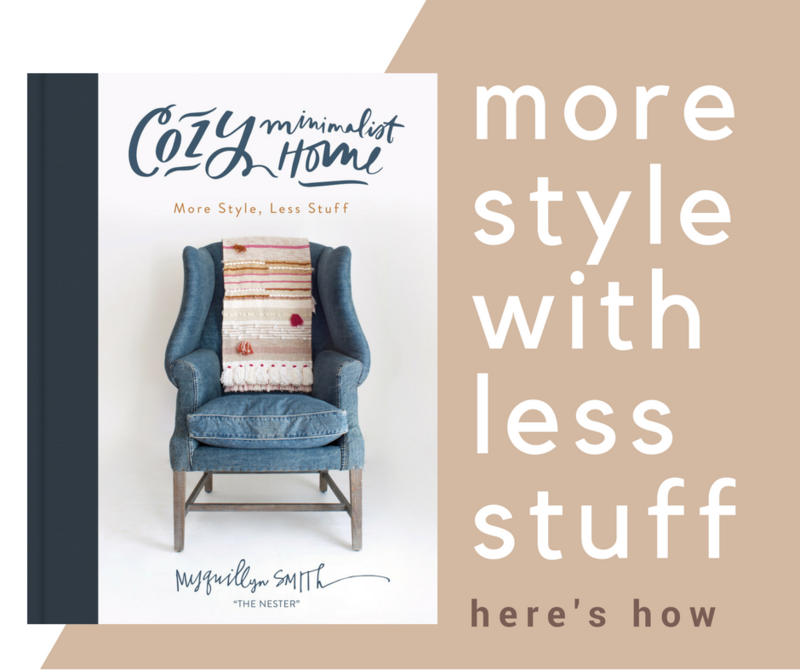 Also, seeing all the buttons on the Linky page makes me anticipate finding new blogs and new blog friends! So, thank you again for doing this! 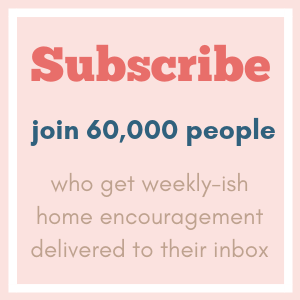 I’m an avid listener of Tsh’s Simple Mom podcast and hope soon there will be a podcast about the challenge because I would love to hear more on it. Emily Freeman talked about it briefly in 2011 so I was glad I could re-listen to that podcast last night in anticipation of writing my introductory post, but I would love to hear more! What a great topic, Emily! so excited! I even made my own little button this year :) thanks for hosting such a great idea. Woot woot! I’ve set my alarm! I’m excited and nervous all at the same time. Here’s to a successful and fun 31 days to all of us!! Good luck y’all! I am so excited! I’m polishing up some posts for the first few days. I still have some questions about technical stuff, so I’m going to look at some of last year’s series. Unfortunately, I woke up with bad allergies this morning and had to cancel some stuff I had planned for this afternoon. Fortunately, that leaves me with more time to plan and write!!! I’m really looking forward to see what everyone does, and I really appreciate the categories this year. It will be so much easier to find series I might like. Thanks, Nester, for hosting again! I’m really looking forward to this. Thanks for giving me a much-needed kick in the pants to get back into blogging/writing and updating my blog. LOVE the video and can’t wait! Way to go, little sis Emily! WOW such detail in organizing and explaining this all! Well done, Nester! Looking forward to the next 31 days and all the offerings! I do every year and so appreciate you taking the time for this and continuing. I’m doing one but not linking up … the video almost convinced me to reconsider… however my Day 1’s set to post at midnight does link to here. Yes different post will go live tonight 8ish with links to all the categories and their linkies. Thanks so much for hosting this. It’s going to be amazing for each of us. Thank you- I needed this…my topic, the timing…all of it. imperfectly perfect. Excited for the journey! I am so excited about this! I don’t have as many pre-written drafts as I would like, but I have placeholders in my WordPress calendar and ideas ready to be written! Yay! I’ve watched the 31 day series go by for a number of years now. I keep thinking fondly that “one day” I’d like to join in and just write. Well. This is my year! Thanks for the challenge, what a great way to get the creative juices flowing! Working this out in my brain. My one year blogaversary is tomorrow (holy cow) and it all started with “31 Days…”. And why did I need a kleenex for that sweet video about Emily’s new book?? Shared it on FB. Love. I just decided to join you all!! Very last minute, but Im excited to challenge myself and follow all you along!! So, OK! I found you just about a week ago .. & life’s been crazy! So, now my intentions are lagging to have a wordpress site up and running by this evening. I still want to be a part. I will write starting tomorrow, but cant’ get all this blog stuff going by the end of tonight! Might I please still be a part of this wonderful impetus to W.R.I.T.E???? Thanking you in advance for your thoughtful consideration of my request! I’m linked to House and Home AND Family Life. I believe the latter to be the best category for me. How do I delete the other? Though I do enjoy participating in this! This sounds like fun, but is it to late to join? I just wanted to clarify, do you pick a now topic each day of just one for the whole time? Thanks hope to hear from u soon! This is great but I already messed up! I didn’t link to my 31 days page and linked only to my blog, you can delete number 212: Sarah. Sorry! PS. Excited about your sister’s book. I had the privilege of hearing your sister lead a session at “She Speaks”, I believe it was 2010. I think I understand now that an opportunity to join at this point is closed. Certainly understandable or the 31 days could go on indefinitely. I hope this is an annual challenge and I trust next year I will see it earlier and not be too late. However, just because I can’t link here certainly doesn’t mean that I can’t write. Maybe my posts will never be read, but the Lord will see and I pray He will refine and direct my writing as I intentionally still take up this challenge and share thoughts with Him. Laura, me too. :( I was so excited to participate in this, and the link seems to be closed earlier than mentioned. So sad. Any way it can be reopened for those of us who tried to post our link before Friday evening? Will you be doing this for November as well? I’d love to do this, I need to get back into writing more. I was wondering the same thing. So sad I missed it! don’t see where to link up. help? please? DLCThe lead singer is Canadian, not French. Chris Squire is the bassist, not guitarist. And I’m fairly sure that no one in the audience could have been accurately characterized by the term “hipster,” even remotely.